We are counting down to the 100th Anniversary and a very full week ahead. We begin with the Lighting of the Dome at the County Executive and Legislative Building at 5:00 p.m. tonight. The Juliette Gordon Low Parkette dedication is in Lynbrook on Sunday at 1:00 p.m. Monday is the BIG DAY with a Sunrise Service here at the Service Center at 7:11 a.m., Open House all day, and Opening of the 2000 Time Capsule at 1912 hours military time - 7:12 p.m. for the rest of us. 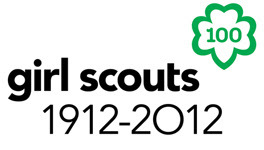 On Wednesday, we welcome Future Girls Scouts at NS-LIJ. Thursday is the 100th Anniversary Gala Kick-off at the Hofstra Club from 6:30-8:30 p.m. And we conclude the week with the Adult Recognitions Celebration on Sunday afternoon, March 18th, at the Hillwood Commons on the LIU - Post Campus at 1:00 p.m.
We know that the Girl Scout Associations have events all week too. So if you are a Girl Scout, check with your community leaders to join in the fun! I hope you will join us at some of these celebrations!